Up next on the blog we have a treat that’s perfect for those nights when you want to eat chinese food, turn on a good movie and veg out. This simple recipe by Cooking Channel TV for baked vegetable spring rolls with sesame lime dipping sauce is a delicious addition to our sweet and sour pork or any Asian cuisine. Feel free to add cabbage, carrots, glass noodles, egg, shrimp, chicken or pork for an additional punch of flavor – it’s really hard to mess these up! Spray a large baking sheet with nonstick cooking spray and set aside. Mix together the sesame oil, soy sauce, ginger, hoisin and garlic in a small bowl or measuring cup. Heat the canola oil in a large skillet or wok. Add the broccoli and sweet potatoes and cook for 2 to 3 minutes. Add the soy sauce mixture and green onions and continue to cook, tossing frequently, until the vegetables are wilted, 4 to 5 minutes. Place 1 egg roll wrapper on a clean flat surface with one corner pointing towards you. Rub around the edges of the wrappers using the banana. Spoon 1/4 cup of the filling into the center of each egg roll wrapper. Fold the bottom corner of the wrapper over the filling. Fold left and right corners over filling. Tightly roll the filled end towards the remaining corner, pressing gently to seal. The end result should look like an envelope. Transfer the rolls to the prepared sheet and brush with canola oil. Bake, turning once halfway through, until golden brown, 12 minutes. Whisk together the soy sauce, lime juice and sesame seeds. At Passanante’s Home Food Service we are more committed than ever to the quality and safety of our foods. If we wouldn’t put it on our own dinner table, we wouldn’t consider delivering it to your door. If you would like to schedule a time to talk with one of our sales reps about our home food delivery service feel free to give us a call at 1-800-772-7786. 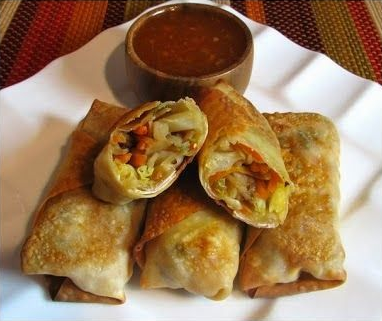 This entry was posted in Recipes, Sides & Salads, Vegetarian and tagged Baked Vegetable Spring Rolls, Gourmet Food Delivery Service, Passanante's Home Food Service, Recipe by Passanante's Home Food Service. Bookmark the permalink.